I realized that “the late Mr. Peyton Jaudon” must have been related to Emily Bennett, whose mother was Maria Conrey (Jaudon) Bennett. Fortunately, a good Jaudon genealogy shows that the bride, Julia Ayamé Jaudon, and Emily Bennett were second cousins. Julia’s father, Samuel Peyton Jaudon (1831–1897), a resident of Japan, had married Oshidzu Matsura – and Julia was their only child. Like the bride, two of the bridesmaids were daughters of Western men and Japanese wives, and the third bridesmaid probably was as well. 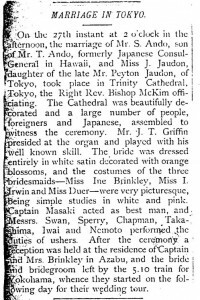 Ine Brinkley must have been a daughter of Captain Francis Brinkley and Tanaka Yasuko, and “Miss I. Irwin” must have been a daughter of Robert Walker Irwin (a descendant of Benjamin Franklin) and Iki Takechi. “Miss Duer” was perhaps a daughter of Yeend Duer. The father of the groom was Taro Ando, a samurai who became a Christian, and who was Consul General in Hawaii 1886–1889. The ushers could not be readily identified since their first names were not given. One of the interesting aspects of the Meiji period in Japanese history (1868–1912) was the large numbers of Westerners living in Japan – and the substantial number of marriages between Japanese and foreigners, which became legal under Japanese law in 1873. See William Wetherall’s work on this subject online at http://members.jcom.home.ne.jp/yosha/yr/nationality/Naturalization_1873.html. Edwin Jaquett Sellers, Jaudon Family of Pennsylvania (Philadelphia: Allen, Lane & Scott, 1924), 32–32, 36–37. See “Francis Brinkley” on Wikipedia. Information confirmed by the leading scholar on the Franklin family, Michael J. Leclerc, who proposes that the letter “I” was for the Japanese first name of one of the Irwin daughters, none of whose Western first names began with I. The account of “Duer, Elizabeth Yeend” (online at collection.legacy.uvic.ca/index.php?artist_id=443&artist_action=info) claims her parents, Yeend Duer and Yasu Tsunekawa, were married in Shanghai in 1885 and did not come to Tokyo until 1904. 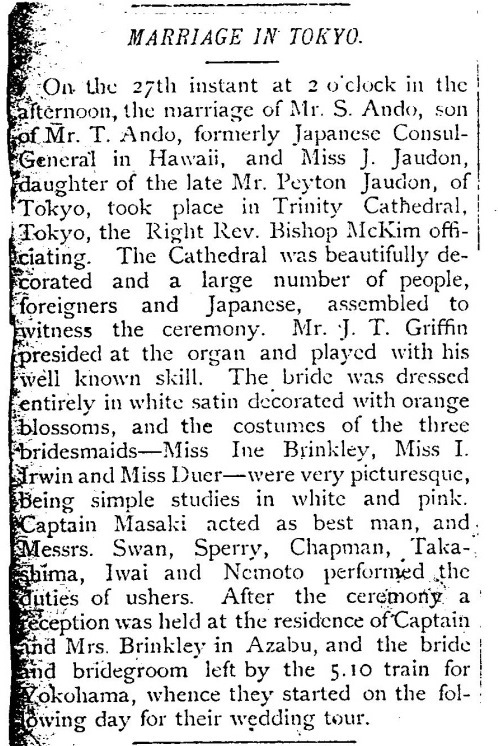 The latter statement clearly is incorrect, as the Japan Weekly Mail of 12 December 1896, page 651, lists Mrs. Brinkley, Miss Brinkley, Mrs. Duer, and Miss Duer at a church bazaar in Tokyo. This Duer family appears elsewhere in the Japan Weekly Mail before 1904, but no other Duer family appears. Yukiko Kimura, Issei: Japanese Immigrants in Hawaii (Honolulu: University of Hawaii Press, 1988), 132, 154, 158. I’m glad to have a chance to say hello and tell you what high regard I have for your work. I’m distantly related to you & your father through a descent from Cornelis Aertsen Van Schaick & Belitje (Arabella) Hendricks through Jeremiah Vorhis (#1184 in “The Van Voorhees Family in America The First Six Generations” (2000) and you & your mother through the Brinckerhoff and Van Voorhees families through Jeremiah Vorhis and his wife Aaltie/Letty Mon(t)fo(o)rt. One of my hobbies is “adding” to and updating the portion of the 1912 Van Wyck genealogy covering the descendants of Theodorus Van Wyck and Margretia Brinckerhoff (the latter a sister of an ancestor of mine, Ida Brinckerhoff, wife of Jan Pieterse Monfoort). Best wishes! In the early 1990s I lived in Tokyo – 1989 to 1993. My husband was a Foreign Service officer stationed at our Embassy. During that time I compiled a book listing the people buried in the Gaijin Bochi (Foreigners’ Cemetery) in Yokohama. This was published in book form by the British Association for Cemeteries in South Asia (BACSA), in London. The book is: “Gaijin Bochi, The Foreigners’ Cemetery, Yokohama, Japan”. There certainly were many foreigners living in that area of Japan at that time. The earliest burial was in 1854. A seaman with Commodore Perry’s crew, Robert Williams, died during the fleet’s second visit to Japan. He was initially buried on the grounds of the Zotokuin Temple in Yokohama. A few years after his death, his body was removed to Shimoda where the U.S. had a consulate. But his burial established this spot as accepted burial place for foreigners of all nationalities who passed away in the surrounding area. Many of these folks were British. But there were a good number of Americans buried there as well. I believe this book is out of print now. But I have extra copies and could send one to your library if you think this may be valuable for people researching ancestors who may have lived and died in Japan. There are over 4,000 souls resting in this cemetery from 41 different countries. I just happen to be the author of the very short article on Elizabeth Yeend Duer, and I am currently working on an full-length scholarly article about Duer as an artist. I do apologize if I was not entirely clear in what appears on line about the Duer family’s movements between 1889 and 1904. Various legal documents and family oral histories suggest that the family returned to Shanghai shortly after Elizabeth’s birth and remained there until early 1904. They did make frequent trips to Tokyo, where Mrs Duer had family, however. Perhaps that is why the Duer’s appear so frequently in the Japan Mail before 1904. I hope this information helps. I found this article by chance. My name is Michael Noel Yeend Duer, the last of the Duer family in Japan. Yeend Duer was my great-grandfather. Elizabeth Yeend Duer, the artist who later moved to Victoria, Vancouver Island, British Columbia, Canada was my great-aunt. I too have found this article by “chance”, but it was through informed research helped along by two very supportive Japanese people. I have been hoping to find a descendent from the Duer family still living in Japan. My connection to the family is via my great uncle, Eric S Bell who was a New Zealander who lived in Japan from 1923 to 1965. During the Second World War he became a civilian internee and lived in a camp, which was an ex Marianist Catholic camp in Uchiyama, Kita Ashigara Mura located in the hills of Kanagawa District. Eric died without family but he maintained contact with my father in Australia and in recent years I discovered he worked as a university lecturer, writer and playwright. The family is attempting to find out more about Eric’s life in Japan. We have been fortunate to have made contact with two people, Ms Mayumi Komiya, and Tokyo resident and associate professor Miyo Sakuma who are part of the organization Prisoner of War Research Network of Japan, who assist in passing on information about POWs. They have both been extremely helpful. They have made mention of a Sydengham Duer, who was interned at the same camp as Eric and who kept a diary of the experience. The diary I believe is titled “THE DIARY OF SYDENGHAM YEEND DUER”. In the diary my uncle is mention on several occasions. My ongoing quest has been to see if any living relative of Sydengham knows of the diary and if public access to the document is possible. It would be an amazing read and shed light on the experiences of the internees. Eric remained in Japan, his adopted home, and continued working up until his death in 1965. I hope to visit Japan in 2017 to investigate Eric’s life a little further and visit his grave site in Numazu. Any assistant that you may be able to provide on this matter would be very much appreciated. Sorry to not have responded to this earlier. Sydenham Yeend Duer was my uncle and I do have a copy of his diary. Let me have your email address and I will send it to you. This is Carolyn from the Univeristy of Victoria. We are currently putting together and exhbition of your aunt Elizabeth’s artwork. The show ought to open in January 2019. I would like to connect with you about the exhibit if possible.